who have the desire and courage to work on an authentic, loving, and mutually satisfying relationship. At times, previously unexpressed feelings or past emotional hurts may create uneasiness or distance between an adult child and a parent whenever they interact. Unresolved family patterns may sabotage individual growth, subtly emerge in romantic relationships, influence future parenting styles, and are passed on to next generations. Guided and structured dialogues support empathic listening, emotional presence, and mutual validation. 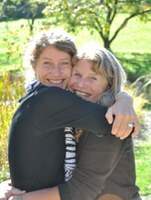 The parent-child pair has the opportunity to open up about previously unexpressed feelings or to clear up misunderstandings, and to become conscious of relationship dynamics within their own family, thus gaining the opportunity to rewrite old family patterns and to create a legacy of honest, loving and supportive relationships. Inter-generational dialogues may also uncover unique resources found in each family, which are honored as a source of strength. Healing repetitive family themes allows members of both generations to become free to develop one's own unique potential as parent, adult daughter/son and relationship partner, while developing a mutually satisfying relationship with each other. We provide the structure for you to feel safe enough to open up in order to reach each other emotionally. At times, adult sons or daughters encourage a parent to spend a weekend together in this special setting – often for no particular reason other than wishing to spend uninterrupted quality time together in order to deepen the relationship between two adults at eye-level. Attending such a workshop can also be accompanied by the hope to express previously unspoken feelings, to resolve conflicts and to be heard and understood. Sometimes it is a parent who takes the initiative to invest this time into an authentic loving encounter. Many parents long to express their validation for their daughter or son in order to strengthen their self-worth and to support them on their way to a self-determined life. By giving this gift of uninterrupted time and willingness to listen, they want to engage with their adult child through an emotional presence, which is hard to achieve by most busy young parents. In order to unfold the full potential of such an encounter, we support you in a safe, mindful, loving and validating atmosphere. We are seasoned and dedicated psychotherapists who have participated in these workshops with our own adult children and/or parents, thus having experienced the sustainable healing impact of this workshop ourselves.